There’s an age old saying that people come together through food. It’s a way for cultures to collide, people to bond, and communities to build. Sharing food has always been part of the human story, and a huge part of mine. I was first introduced to Turkish food, thanks to my sister, after finding true love with Melih, who was born and raised in Turkey. They met in Minneapolis, MN and had an instant connection. During our conversations, she would rave about his cooking and passion for food. When I visited the Twin Cities in 2010, my sister introduced me to Melih one evening at the small family Turkish restaurant he helped operate. He was amazing in the kitchen and created the most delicious meal for us! A few years later, my sister and Melih married and moved from Minnesota to Denver. In the years knowing Melih, my family and I have been spoiled with authentic Turkish cooking, as he frequently cooks for our family. One Thanksgiving, Melih debuted his Lentil Soup which consisted of red lentils pureed with dried crushed mint, paprika, and black pepper – the perfect first course! He is known as the “grill master” at my parents’ house and makes the best shish kabobs on the planet. He has hosted and planned the menu for many family functions and is the go-to guy for any cooking question. Melih has brought life and creativity into cooking, which is refreshing. His genuine passion for cooking has made me love and appreciate the culture that has brought our family together. It has always been a dream of Melih’s to open his own restaurant, which is why I’m excited to introduce an amazing chef and business near and dear to my heart, Bosphorus! 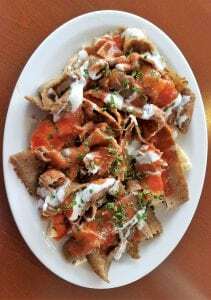 Tucked into the quaint neighborhood of Englewood, off E Hampden and S Downing, Bosphorus has already attracted the attention of locals. The large sign out front is brand spanking new, inviting guests to sit back, relax and enjoy a one-of-a-kind experience. My husband and I had the opportunity to attend a private tasting shortly before opening and were blown away by the creative flavors and presentation. My husband thoroughly enjoyed the Sultan platter offering various meats and sautéed veggies, while I favored the fried eggplant and spinach pie. Everything was fresh, lightly seasoned and cooked to perfection. The open kitchen allowed us to see where the magic happens, while creating a comfortable environment. Lets’ not forget dessert! 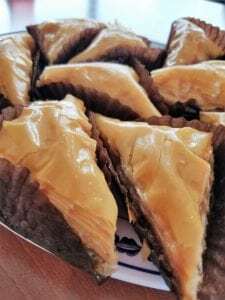 The Baklava was syrupy, flaky and downright awesome. Pair that with a cup of traditional Turkish tea, and we were in Heaven. After stuffing our bellies full, I had the chance to sit down with my sister and Melih to talk about the restaurant business, their success in Colorado, and hopes for the future. Bites with Blondie: Thanks for taking the time to chat with me – before it gets busy! How did you get your start in the food industry? Melih: Growing up in Ankara, Turkey, I spent endless time in the kitchen learning to cook from my father and paternal grandmother. They taught me the authentic Turkish dishes and I learned the significance of good food, as it brought everyone I loved together. Food became a passion at an early age, and I knew it was something I wanted to pursue. In high school, I studied tourism and hospitality and started working in the food industry to gain experience. After moving to Minnesota in 1997, my most notable role was chef at a local Turkish restaurant. 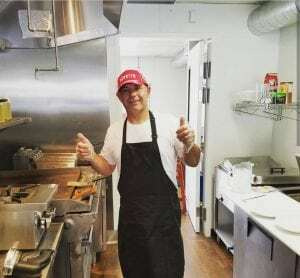 Bites with Blondie: What made you want to open a restaurant in Colorado? 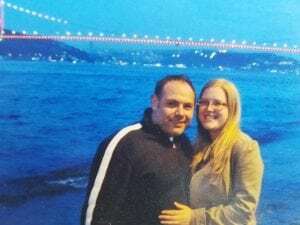 Melih: My wife’s family is from Colorado; so, we decided to move here from Minnesota to start our family. 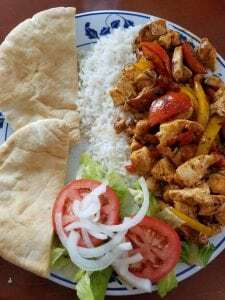 Even with the variety of food in Denver, we couldn’t find a Turkish restaurant serving authentic cuisine in the metro area. Because I love my culture and wanted to introduce it to others, I saw the value of opening our restaurant in the Denver Metro. It took a while for me to find the right location, but I love the diversity of the area and chose this spot to renovate. The surrounding neighborhood and community has been so welcoming. 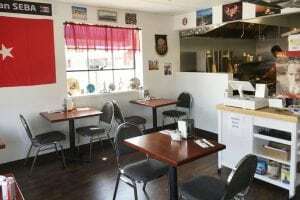 Bites with Blondie: Was this space a restaurant before? Melih: The space was a boutique and salon prior to us renovating it to be a restaurant. The renovation took much longer than we expected, spanning one year from us signing the lease. We are happy the construction is now complete, and we’re open for business! 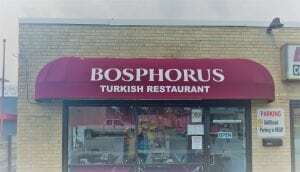 Bites with Blondie: How did you come up with the name Bosphorus? Melih: The Bosphorus Bridge is the first of three suspension bridges over the Bopshorus Strait connecting Europe and Asia, which links the Black Sea to the Sea of Marmara. We chose the name for the restaurant because our goal is to bridge the cultural divide of East and West through delicious food and welcoming hospitality. Bites with Blondie: I love the décor in here. It’s so unique and feels like I stepped into a home in Turkey! Did you have all the decorations on hand? Where are they from? Melih: I try and travel to Turkey at least once a year to visit my family. Whenever I go home, I bring back as much as I can: spices, coffee, jewelry, decor, etc. Everything in here is from Turkey; my wife took all the photos you see hanging on the walls from our travels together in Turkey. We wanted the space to feel authentic and comfortable. I think of the space as my own living room and customers as guests in my own home. Bites with Blondie: I see you were recently featured in Westword by Mark Antonation, praising, the business for being the first of its kind in Denver, and the delicious food. How has this impacted business? Any other notable guests? Melih: I didn’t even realize Mark came into the restaurant and wrote the article until a guest said we had been featured. I was surprised and excited. After the article came out and more people saw it, business definitely picked up. At that point, we realized we would have to hire more help. Most recently, we served Jeff Bridges, a member of the Colorado House of Representatives from the 3rd District. He was very complimentary. Additionally, we served a group of service members from Buckley AF Base who had recently returned home from Deployment in Turkey. They admire our authenticity and continue to frequent our restaurant. However, we consider all our guests to be notable. Our family has been very supportive to get the word out as well, so we can only hope to attract more guests. Our Yelp, Google, and Facebook pages are getting a lot of traffic too. Come in and let us know what you think. Bites with Blondie: Everything tastes so fresh, hearty and is the perfect portion! What is your favorite dish on the menu? What is your favorite to introduce guests to? 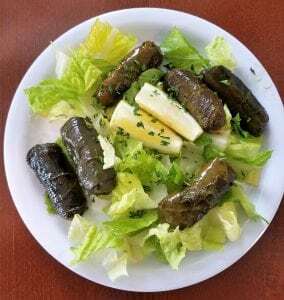 Melih: My favorite dish on the menu is Iskender Kebab – Sautéed pita bread topped with layers of yogurt, special hot tomato sauce, and chicken or beef-lamb gyro. 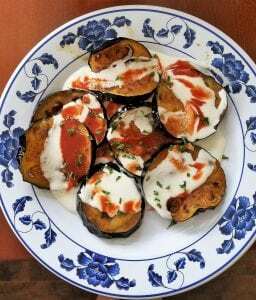 It’s a true Turkish classic and I make the yogurt sauce myself. 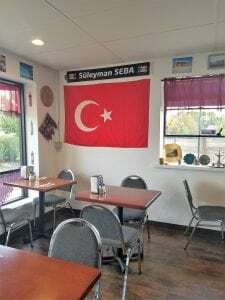 I recommend guests try the Bosphorus Platter for an appetizer and the Sultan Platter for an entrée. In Turkish culture, dishes are meant to be shared and these two menu items are the perfect pair to split amongst friends. They also allow guests to get a good sample of the items on the menu. Bites with Blondie: Any plans to expand? Melih: We are taking it one step at a time as we’ve only been open for six weeks. We’re considering several ideas to better serve our guests such as; delivery and catering options, serving alcoholic beverages, and expanding into the space next door. We’ve also considered adding outdoor seating on our side patio. However, we want to make sure we can keep up with business! All in good time. Bites with Blondie: If you were to invite anyone, dead or alive, to experience your restaurant and cuisine, who would choose and why? Melih: My father. He passed away in 2009 and I would love for him see the life I’ve built in Colorado and see what suggestions he would have for my cooking, as he was my first teacher. …and just like that, what was once a dream, is now a reality. Bosphorus is open daily from 11AM – 9PM, closing on major holidays. Stop by, say hi, and transport yourself to Turkey. Katie traded in her flip flops for hiking boots at age three when her family moved from sunny Florida to even sunnier Colorado. Katie’s passion for food began at an early age when she would retrieve a strip of bacon from the counter each morning - a daily treat from her nanny. That was only the beginning for her love of food. After graduating with a degree in Communications (with an emphasis in Public Relations), she got her foodie start as Yelp Denver’s first intern and has been scouting places to nosh all over Denver since. For the past 9 years, Katie has maintained Yelp Elite status and made lasting relationships with local business owners, while continuing to be an avid food consumer and writer. Her latest cravings and discoveries are frequently documented on her Yelp page. Katie is known for her unique and witty writing style, obsession with avocados, and is considered the go-to girl when it comes to finding a place to dine. When she’s not finding a way to quit her day job to be the next Guy Fieri, she can be found slinging balls on the golf course, binging on true crime podcasts or indulging at a local brewery in the burbs. Look for her work each Friday under Bites with Blondie.